To keep your septic tank or cesspit working exactly as it should and without the disruption caused by blockages and overflows, it needs to be emptied on a frequent basis. Draintech has been trusted for a number of years to empty domestic septic tanks and cesspits as we offer our clients reassurance of a professional, speedy service that doesn’t cost the earth. 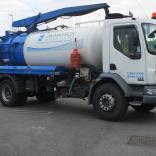 The frequency with which we need to empty your tank and cesspit depends on the size and type of your tank and the number of occupants living at your property, but we recommend you empty it at least every six to twelve months to remove the build up of sludge that occurs.